Given by Morris & Co. In Britain, paper printed with patterns has been used for decorating walls since the 16th century. By the late 19th century wallpapers were widely used by all classes, in homes and also in public buildings. William Morris designed a number of wallpapers, all with repeating patterns based on natural forms. Many of Morris's wallpaper designs were based on plant forms which he studied at first hand. Some of his patterns, such as 'Trellis' and 'Garden Tulip' were drawn from plants in his own gardens. Others - such as 'Willow Bough' - were inspired by wild flowers and trees which he had seen on country walks. In 1881 he gave a lecture entitled 'Some Hints on Pattern Designing' in which he argued that the ideal pattern should have 'unmistakable suggestions of gardens and fields.' Morris also found ideas for his designs in the simple woodcut illustrations in 16th-century herbals (books describing plants and their various uses in medicine and cookery). He owned several books of this kind, including a copy of Gerard's Herball (published 1597) in which a willow branch is illustrated. 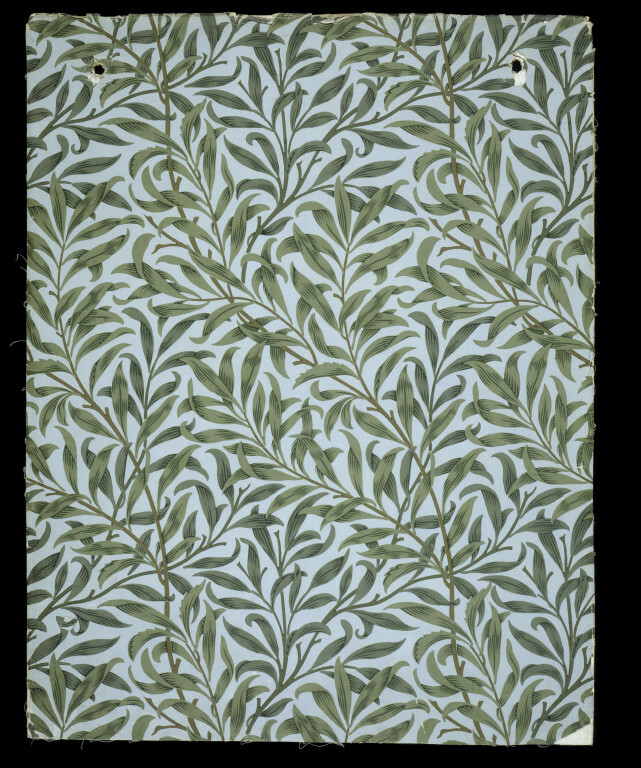 The willow was one of Morris's favourite motifs and he used it in several of his designs for wallpaper and for textiles. Sometimes he used a small-scale pattern of simplified willow leaves as a background to other motifs, as in 'Lily' (1873) and 'Powdered' (1874). Also in 1874 he designed 'Willow', a simple stylised representation of willow branches on a dark ground. 'Willow Bough' is a more naturalistic version of this earlier pattern. 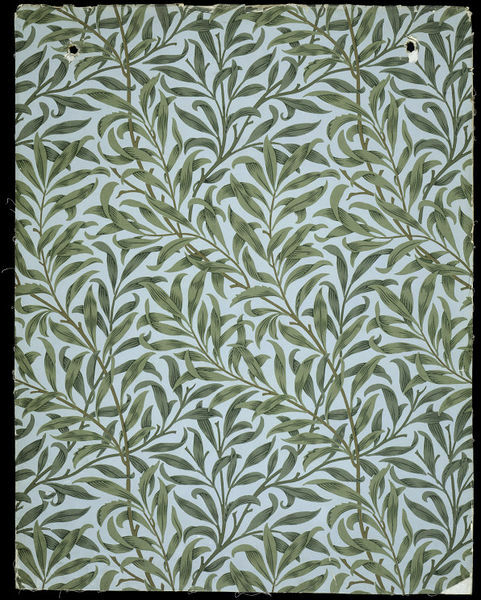 Specimen of 'Willow Bough' wallpaper, a foliate pattern of intertwined willow leaves, green on pale-blue ground; Block-printed in distemper colours, on paper; Inscribed on the back in ink with title, number and price. Part of 'Volume 2', a pattern book containing 27 Morris & Co. patterns from 1862-81 (E.530-608-1919). Printed in London by Jeffrey & Co. for Morris & Co. The willow branch motif is basd on direct observation from nature. May Morris describes a walk with her father that inspired this design (see V&A Morris Catalogue, L.24). 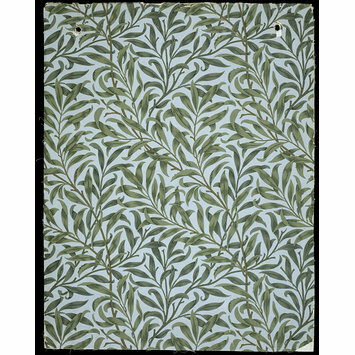 Specimen of 'Willow Bough' wallpaper, a foliate pattern of intertwined willow leaves, green on pale-blue ground; Block-printed in distemper colours, on paper; Designed by William Morris; Printed by Jeffrey & Co. for Morris & Co.; Part of 'Volume 2', a pattern book containing 27 Morris & Co. patterns from 1882-96 (E.530-608-1919); England; First issued 1887. Parry, Linda, ed. William Morris London : Philip Wilson in association with the Victoria and Albert Museum, 1996. Published to coincide with an exhibition at the Victoria and Albert Museum, 9 May-1 Sept. 1996. Within pattern book Volume 2 (1882-96).